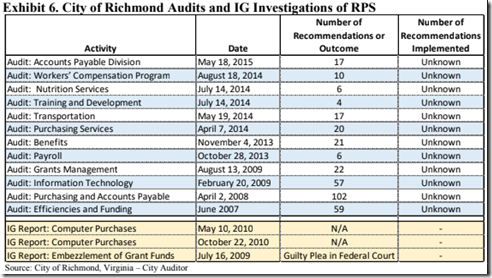 The estimable Carol Wolf points me to a June, 2018 Review of the Finance and Business Operations of the Richmond Public Schools prepared by the Council of the Great City Schools. First the Good News: Our new Superintendent requested the study. The rest is Bad News. You really should read the report to understand what a huge hole Mr. Kamras is trying to climb out of. The team noted an absence of focus on successful student outcomes. The team did not see any evidence that the district has developed an action plan to address the issues identified in the Memorandum of Understanding or has used the MOU as an opportunity to accelerate change. When the team asked for a copy of the district’s Corrective Action Plan, the team was told, “We are working on our CAP with the state now.” Additionally, a request for samples of the last six “required monthly updates” on steps taken to implement corrective action in the areas of operations and support services went unanswered. There is a lack of communication channels up-and-down and side-to-side within and between departments. The team was told that . . . Departments work in silos with little communications between and among staff teams . . . The team found few analytical tools and techniques, such as key performance indicators (KPIs), are used to measure and compare performance to increase effectiveness, achieve greater efficiencies, and set goals. None of the interviewees could articulate a vision, mission, goals, objectives, or priorities of the administration. Although employee performance evaluations are generally issued annually, assessments are not tied to goals or accountabilities. Business plans with goals and objectives, benchmarks, accountabilities, timelines, deliverables, cost estimates, cost-benefit analysis, return on investment, and other analytics are generally not used or required. Performance metrics to drive programs and support projects and initiatives have not been developed. The lack of a robust position control and management system has created frustration and finger-pointing between budget and human resources departments. Purchase orders are required for all purchases, regardless of value. 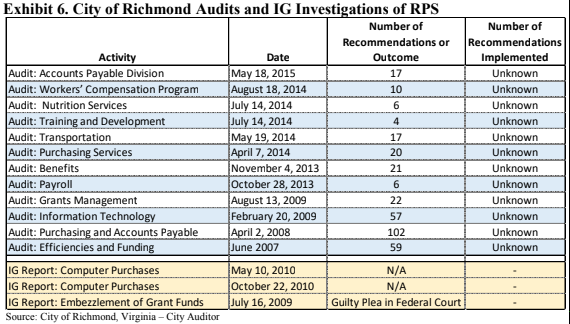 The team was unable to determine if any of the 27 recommendations from the August 2004 School Efficiency Review: City of Richmond Public Schools Division, conducted by the Commonwealth of Virginia – Office of the Secretary of Finance, were acted upon. The team noted . . . [l]ittle recognition by most interviewed of how their specific role and function supported the classroom, students, or student achievement. The internal audit function is misaligned in that the current reporting relationship represents an internal control issue as the independence of the function has the potential to be compromised. . . Further, the Internal Auditor is not included in the distribution of the external audit reports. The district’s Enterprise Resource Planning (ERP) legacy software system is antiquated (25+ years old), highly customized, and highly inefficient. Annual building safety inspections are not taking place.